the range of plant heights observed from a survey on the Santa Margarita Ecological Reserve on 9 July 2004. The range in the number of flowers per head is distinctly larger than that given in the floras. I observe from 5 to 8 flowers per head, with outliers up to 10 flowers per head. In comparison, Munz in A Flora of Southern California states that the number of flowers per head for all subspecies of Stephanomeria exigua is mostly 5. The Jepson Manual gives the range as 5-6. In addition, individual plants show dramatic variability. They can have essentially any combination of minimum and maximum number of flowers per head, ranging from plants with heads containing just 5-6 flowers per head to plants with heads containing 7-8 flowers per head to plants with heads containing 5-8 flowers per head. Measured heights for these plants range from 6 to 18 dm, far taller than the 2-6 dm claimed in the floras, even in the half-normal rainfall year of 2004. I recommend that you read Stephanomeria virgata prior to reading this page, since it discusses the data collection on the Dripping Springs Trail, and contains explanatory material that is not repeated below. See also a Photograph of Stephanomeria achenes, with the caption given here; and the geographical distribution of this species and closely-related species. In the course of field work for the plant trail guide for the Santa Margarita River, I kept track of the number of flowers per head. I verified that each specimen was Stephanomeria exigua ssp. deanei by first recognizing the habit of the plant (spreading branches, long peduncles), which is significantly different from that of Stephanomeria virgata. I then verified the identification for each specimen by checking for the presence of stalked glands in the involucre and peduncle. There were hundreds of Stephanomeria exigua ssp. deanei plants on this trail, but only a single specimen of Stephanomeria virgata. The single specimen of Stephanomeria virgata occurred on the only portion of the trail that was not immediately next to the Santa Margarita River, next to a dirt road. I compiled data separately by plant in some locations, and by groups of plants in other locations, and recorded where along the trail each plant was located. Analysis of the data showed that the distribution of the number of flowers per head was consistent for all the plants from the beginning of the trail to mile 1.3 (total of 90 heads observed from ~ten plants at five different locations). The distribution was also consistent for all the plants near mile 2.00 (total of 28 heads observed from three different plants). However, the distributions for these two separate areas were not consistent. The plants in the first 1.3 miles of the trail have mostly 5-6 flowers per head, but almost 20% of the heads have 7 flowers, and a single head out of 90 heads had 8 flowers. Surprisingly, the plants near mile 2.00 show a completely different distribution, with mostly 7-8 flowers per head, and a smaller number with 5-6 flowers per head. These two groups of plants showed no difference in their overall morphology or glandularness. The only apparent difference was that the plants near mile 2.00 were larger on average, with some specimens as tall as 15 dm. No plant in the first 1.3 miles was taller than ~10 dm. The size difference in these plants may be due to different habitats. The plants in the first 1.3 miles were mostly growing in significant shade from the south bank of the Santa Margarita River and from numerous Quercus agrifolia ssp. agrifolia. That section had been burned in the previous growing year in the February 2002 Fallbrook fire, but the oaks had regrown nearly their full canopy. In contrast, the plants near mile 2.00 were growing on top of the south bank of the River, in a much more open, flatter environment, that did not burn in 2002. Surveys on the Dripping Springs Trail on 17 November and 3 December 2003 show that the variation seen above on the Santa Margarita River are fully consistent with the normal population variation for Stephanomeria exigua ssp. deanei. For complete information on the data collection and the populations of different Stephanomeria species on the Dripping Springs Trail, see Stephanomeria virgata. I separated out the plants near mile 0.5 on the Dripping Springs Trail on 3 December since they were distinctly different in their number of flowers per head than the rest of that species on the trail. But when placed in the context of all the other variation seen here, it is apparent that this taxon simply exhibits considerable variability in the number of flowers per head. In particular, note the population beyond mile 0.6 that was surveyed on the two different days. (The population near mile 0.5 was only surveyed on 3 December.) Even though this is the same population of plants, on 3 December they showed a concentration toward 5-6 flowers per head, yet on 17 November they showed a concentration toward 8 flowers per head! These plants did not change their genes during that 16 day interval. It thus is dramatically clear that there is considerable variability in the Stephanomeria exigua ssp. deanei population, which is demonstrated most vividly by examining individual plants. The plants near mile 0.5 were much smaller than the rest of the plants on the trail. They were 6 dm, whereas the typical plant on the rest of the trail was ~10 dm, with some specimens as tall as 17 dm. This is the same pattern that was observed on the Santa Margarita River, with the smaller plants having 5-6 flowers per head and taller plants having up to 8 flowers per head. The above plot contains only the subset of the data which kept track of the variation for individual plants. If this plot is confusing to you, see Stephanomeria virgata for an explanation of how to interpret this plot. Some points are dithered slightly in order to show all the points on the plot. Note that nearly every possible combination of the minimum and maximum number of flowers per head is shown in the entire population. There were a large number of plants that had a minimum of 5 flowers per head, and a maximum of 6, 7 or 8 flowers per head. Somewhat fewer plants had a minimum of 6 flowers per head, and a maximum of 7 or 8 flowers per head. A single plant was observed to have a minimum of 7 flowers per head and a maximum of 8 flowers per head, and another single plant with a minimum of 8 and a maximum of 10. The only combinations that were not observed, up to a maximum of 8 flowers per head, were plants that only had heads with 5 flowers per head, or only with 6 flowers per head, or only with 7 flowers per head. This plot shows that individual plants of Stephanomeria exigua ssp. deanei exhibit considerable variability in the number of flowers per head. Therefore the results seen on the Santa Margarita River, that appeared to show two distinct populations, simply were produced by small number statistics coupled with the intrinsic variation in the population. The maximum number of flowers per head seems to be somewhat correlated with the size of the plant. The plants near mile 0.5 were much smaller than the rest of the plants on the trail. They were 6 dm, whereas the typical plant on the rest of the trail was ~10 dm, with some specimens as tall as 17 dm. This is the same pattern that was observed on the Santa Margarita River, with the smaller plants having 5-6 flowers per head and taller plants having up to 8 flowers per head. It is possible that this correlation of number of flowers per head with the size of the plant has biased deductions made from herbarium vouchers, due to a possible tendency for botanists to collect plants that will entirely fit on an herbarium sheet. A total of 171 heads are plotted above. The error bars are propagated one sigma sqrt(N). Just over 2/3 of all the heads have the 5 or 6 flowers circumscribed in the floras. Almost 1/3 of the heads have 7 or 8 flowers, with even an outlier at 10 flowers. Note that this histogram describes the population variation within Stephanomeria exigua ssp. deanei; individual plants, as shown above, can and do have dramatically different histograms. Thus if you sample enough plants, you will see one or more plants that have only 8-10 flowers per head, very different from the "average" plant of this taxon. For speculation as to why the floras are so deficient in summarizing the number of flowers per head, see Stephanomeria virgata. Michael Fugate collected data on a population near the city of Riverside that had always confused him, due to the conflict in the observed number of flowers per head versus the range given in the floras. Michael sent me pictures of his plants which left no doubt that he was observing S. exigua, since the heads on his plants were on long peduncles. Five of the plants had large numbers of heads observed on each, and hence are plotted separately above. Note that in order to put the total from all 12 plants on the same plot with individual plants, I have plotted the total from all plants divided by a factor of two. Michael's data are especially interesting, since those five plants were followed repeatedly to build up good statistics on their distribution of the number of flowers per head. Plants 2, 7 and 12 clearly have lower average number of flowers per head than plants 1 and 3, showing significant variation between plants in this population. My data contain the same 171 heads plotted previously. Michael's data contain a total of 381 heads. The error bars are propagated one sigma sqrt(N). Although these histograms are clearly significantly different, recall that my data contain a set of plants that has the same distribution as in Michael's data (see the first plot above), and that Michael's data contain two plants with a distribution more similar to the histogram of my plants. Individual plants vary! From my data, the maximum number of flowers per head seemed to be somewhat correlated with the size of the plant, but Michael's plants do not support that correlation. Most of Michael's plants are short, under 60 cm, compact with many intertwined branches, with only a few very leggy closer to 100 cm (such as plant 2). It will be interesting to study other populations in the depth that Michael did to see if there is any geographic variation in the mean number of flowers per head, and to study Michael's plant in future years to see if different environmental conditions from year to year change the mean number of flowers per head, similar to what I observed on the Dripping Springs Trail over a span of 16 days. I collected fruit from five locations on the Dripping Springs Trail, at mile 0.54, 0.66, 0.77, 1.90 and 2.56. I measured the pappus to be plumose on the upper 40-65%, slightly more than the 55-60% quoted in the JM. The averages for each location were 50, 40, 50, 65 and 55%, respectively. The seed lengths ranged from 2.1 to 3.0 mm, but plants from individual locations had similar lengths for all their seeds. The averages for each location were 3.0, 2.65, 2.5, 2.2 and 2.25 mm, respectively. This range of 2.2-3.0 mm is larger than the 2.0-2.5 mm given in the JM description (oddly, the JM key gives a more restricted range of 2.1-2.4 mm). All seeds had a narrow longitudinal groove on each of their five sides. On 8 December 2003, during a specific survey for Stephanomeria at the Santa Rosa Plateau Ecological Reserve, I discovered a widespread large population of Stephanomeria exigua ssp. deanei, as well as a separate widespread large population of S. diegensis. The only Stephanomeria species on the plant list for the area by Lathrop and Thorne (1985) was S. virgata. None of the hundreds of plants I examined could be identified as S. virgata. Hence either Lathrop and Thorne somehow missed this extensive population, or they misclassified it as S. virgata. All specimens sampled near the Visitor Center, from the first ~0.30 miles of the Wiashal Trail and from the 0.70 mile portion of the Granite Loop Trail south of Waterline Road, were S. exigua ssp. deanei. All specimens sampled about 2.5 miles south of the Visitor Center, from the Mesa de Colorado along the Vernal Pool, S. Los Santos and S. Trans-Preserve Trails, were S. diegensis, and will not be further discussed here. See Stephanomeria diegensis for further information on this population. The inflorescence morphology of the population near the Visitor Center was clearly that of S. exigua ssp. deanei, with spreading fairly slender branches containing solitary heads on clear peduncles. All phyllaries were stalked-glandular. I collected three fruit samples from locations spaced about 0.3 miles apart. All samples had a pappus of bristles that were connected in small groups to scales of ~0.1-0.3 mm, and the bristles were plumose only in their outer ~50%. All seeds had clear longitudinal grooves in the center of each side. I measured the height of each specimen with a tape measure in the field. The first 14 plants I measured were at a single location that was different from most of the other specimens. That location was near a drainage, in fairly heavy shade from Quercus agrifolia. All other specimens were in a much more open location along a trail, and were shaded, if at all, only in their lower portions by shrubs such as chamise, Adenostoma fasciculatum, that were typically about 1 m high. I measured only specimens easily accessible from the trail itself, which were probably ~80-90% of all the specimens visible, due to the preference of this taxon to the open area provided by the existence of the trail. I did not measure every group of S. exigua that I saw. I measured every specimen in the beginning portion of each trail, and thereafter measured specimens that were somewhat separated from ones I had measured, to provide a fairly uniform sampling along the trail. I observed no distinction between groups I measured and ones I did not measure, due to proximity to measured groups. If any of those nearby groups had been significantly shorter or taller than the measured group, I would have measured them. I measured the first 14 plants roughly in order of height, which accounts for the trend of decreasing height with plant number. Also, that sample contains shorter plants on average than the rest of the measured plants. I attribute that to the shadier environment in which these plants grew. The possibility of a bias due to my preferentially noting plants of taller than average height needs to be addressed, since none of these plants were blooming except for a handful of the plants in the shade at the beginning. Even in bloom, S. exigua plants, especially the shorter ones, are not terribly conspicuous. Any bias seems to be small, for the following reason. Whenever any single plant was noticed, I measured every single plant in the vicinity. Thus any short plants growing nearby taller ones would have been measured. The plot above shows that there was a considerable range in height for plants after the first 14, from 8 to 18 dm. The 8 dm high plants were quite obvious to me; if any 4-8 dm high plants nearby existed, I would have noted them. Furthermore, the minimum height of plants after the first 14 is roughly the minimum height of the first 14 plants, which is consistent with the hypothesis that I did indeed sample down to the shortest plants everywhere. The height of all the plants range from just over 6 dm to almost 18 dm, which is identical to what I noted from the two other areas surveyed previously, the Santa Margarita River and the Dripping Springs Trail. Hence these results are probably close to the same results that would be obtained from a similar survey on those trails. Within the propagated one sigma sqrt(N) error bars, this histogram is consistent with a smooth distribution peaking somewhere between 8 and 13 dm, with a maximum plant height of 18 dm. On 9 July 2004, I measured the minimum and maximum heights of plants in bloom along the main road down the north bank of the Santa Margarita River at the Temecula Gorge. The range was 6.7 to 11.3 dm. What makes this measurement interesting is that 2004 was a pathetic rainfall year there, with the rainfall being half the average amount. Furthermore, this south-facing bank is one of the drier areas there, in full sun. Hence this is an especially telling comparison to the heights of 2-6 dm given in the floras. I have made an incorrect species identification. This seems extremely unlikely, and I believe that the identification of these plants is 100% secure from observing numerous characteristics only consistent with S. exigua ssp. deanei, and inconsistent with any other identification. 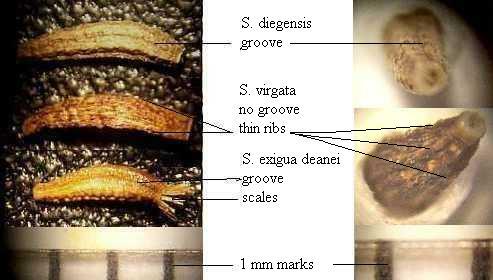 The only potential other identification is S. virgata or S. diegensis, both of which are strongly ruled out by the inflorescence morphology; the pappus of bristles connected in small groups to scales of ~0.1-0.3 mm; and the bristles plumose only in their outer ~50%. In addition, S. virgata is ruled out by the stalked-glandular phyllaries, and the seeds with clear longitudinal grooves in the center of each side. I am quite familiar with all three species, having closely observed on the order of a thousand specimens, and studied in detail on the order of a hundred closely within a one-month span. I have never had a problem in determining the identification of any specimen. Ssp. deanei is different in height from the other S. exigua species. Perhaps the original vouchers of deanei happened to be stunted plants, and no one has ever revisited the height previously to this analysis. Populations in the SRP - Santa Margarita River - Agua Tibia Mountains area represent a significant new population of ssp. deanei, that are different in height from the other populations of ssp. deanei. It is interesting that Davidson and Moxley, in their 1923 Flora of Southern California, state that S. exigua is a species chiefly of the desert area and eastward. It would not be surprising that specimens of this species growing in the desert would be shorter than coastal specimens. Misidentification of plants taller than 6 dm as S. virgata. Perhaps botanists have assumed that plants taller than 6 dm must be S. virgata, and thus no collections have been made of taller plants. This suggestion, combined with the previous one, may be the most likely ones. It would account for why Lathrop and Thorne did not find S. exigua at the SRP. Furthermore, it could explain why the JM drawings of S. virgata ssp. pleurocarpa and S. exigua ssp. exigua appear identical, and both are unlike true S. virgata. See Comments on the Jepson Manual and A Flora of Southern California by Munz: Stephanomeria. These plants are all a new subspecies of S. exigua, and I have not located any actual ssp. deanei. While this is of course possible, it is not clear to me how this population would be segregated from ssp. deanei. Bias in vouchering. Perhaps botanists have preferred to collect the shortest specimens so that they will fit on a herbarium sheet, and did not note in general the average height of surrounding plants. As mentioned above, this might also account for the error in the number of flowers per head reported in the floras. A different vouchering bias, due to preferential vouchering from desert areas, is the same effect as discussed above under the possible population difference between plants in the SRP - Santa Margarita River - Agua Tibia Mountains area and the plants in the desert areas. Unusual growing conditions in 2003. This seems quite unlikely, since 2003 was an almost dead-normal rainfall year, with fairly normal weather. Although it is possible that plants on the Dripping Springs Trail received some beneficial summer rainfall, that was not the case at the Santa Rosa Plateau or at the Santa Margarita River. Of course, the observations now added from 2004, a half-normal rainfall year, clearly refute any claim of bias due to unusually good growing conditions in either year. Small sample statistics. The annual Stephanomeria species seem to win the prize as the most poorly-described species in the floras. I can't recall any other species whose description in the floras are off in so many ways, nor any that have even half the number of such discrepancies. Perhaps this is because these plants bloom mostly at low altitudes during the heat of the summer, when botanists are off on summer vacations or botanizing in the mountains. Thus the range of parameters for these species may have been limited by too few collections from too few locations. A typo in the original height description for S. exigua, which has been forever repeated without critical examination. Some rainy day I may try to do some research into the history of quoted heights, as well as the history of the quoted number of flowers per head. Until then, if any reader has any additional insight into the source of this discrepancy, please let me know.